I told you the sheep are a bit camera shy after they've first been sheared, despite the fact that they really do look fabulous. As for the little unsheared lamb, it obviously knows it's not supposed to be in the bunk feeder. Of course I could be wrong all around, and they simply had no intention of missing out on one second of inhaling their evening treats just so I could take a picture of them. You never know with sheep. What other excitement did we have yesterday? Well, it turned out to be Snake Day on the farm. I know many of you cannot stand the sight of snakes, but others find them fascinating, so I've posted a couple of photos and a little bit about them on my Farm Photos Overflow Blog. Click here if you like snakes. 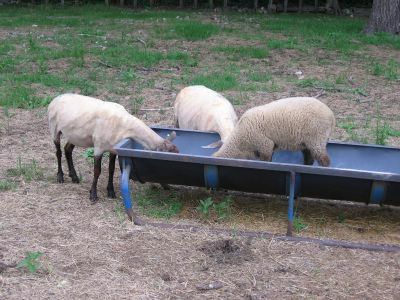 As for today, we're starting to cut hay so the sheep and llamas and Donkey Doodle Dandy will have something to eat next winter. It's going to be a long, hot, tiring, sweaty, itchy, achy few days. The best thing about 'being in the hay?' Getting out of it! Though it does feel incredibly good to have the job done. Click here to revisit a few of last year's haying season photos. Haying? Gee, you must have sun. Those of us in NH have forgotten what that's like. Itchies are NO FUN. Lots of oatmeal baths help - better you than me!